The new Fed chair quickly discovered that the financial markets don't always take kindly to "real talk". Clearly, everyone is aware that we'll eventually have to move toward some sort of normalcy when it comes to monetary policy but they don't want to be reminded of it. The phenomenon is similar to eating chicken and pork because it tastes good, while intentionally ignoring where it came from and the steps taken for it to get onto your plate. Janet Yellen stuck to the game plan overall, but mentioned that adjustments in policy toward higher interest rates could come as early as six months down the road. She also diversified her decision making; rather than the tapering being contingent on employment she will be looking at a basket of economic data. Initially, the seemingly innocent comments triggered a swoon in both stocks and bonds, but after having some time to digest, it appears as though the markets have stabilized. Today's rally in the ES can be attributed to many possible catalysts, but we believe it is simply the ever reliable quadruple witch rally (see more details below). We believed the Treasury market would react favorably to the FOMC meeting, but it did the opposite. We were assuming the Fed would taper it's bond buying program by another $10 billion per month...and it did. In our view, the measured tapering had already been accounted for and didn't change the fact that they are still a big bidder of their own securities. However, we did NOT expect Yellen to mention interest rate hikes at this stage in the game. Traders seemed to come into today's session with cooler heads. The stabilization of pricing was promising, but the chart is as neutral as they come. Ideally we'd like to be bulls but we'd rather wait for better levels before acting on it. 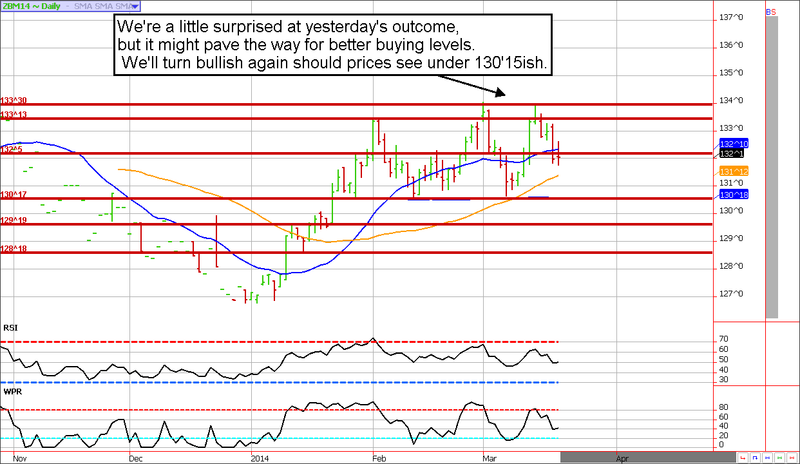 The market is trading in a well defined range, so it isn't out of the question for prices to retest the mid-to-low-130s in the June ZB (30-year bond futures). If they do, we'd be comfortable getting bullish. **Consensus:** Bulls shouldn't plan on getting aggressive unless we see a dip into the mid-to-low 131s. All week we had been touting the market's tendency to melt higher into the quadruple witch (futures expiration on Friday morning). Early in the week, the markets were right on track but Yellen's reminder of the inevitable, higher interest rates, seemed to interfere with the market's fate. Yesterday afternoon we had our doubts about the quadruple witch rally, but today it was in full force. As a reminder, the market often posts an early morning high on the day of expiration (Friday). As the current futures contract comes off the board, the next contract month (June in this case) typically runs into weakness as Friday progresses (but sometimes it takes until Monday for things to kick in. If you are a bear, look for a rally tomorrow morning to consider pulling the trigger. Ideally, 1880 (if seen) would be a good place to start, but position traders must keep in mind that a temporary push to 1900 is possible. **Consensus:** The highs might be near, but that doesn't mean we can't see 1880ish, or maybe even 1900 in the coming days. Nonetheless, the best trade will likely be from the short side (preferably at the noted levels).